ICs built using <40nm technology forecast to account for all of the pure-play foundry sales growth in 2015. 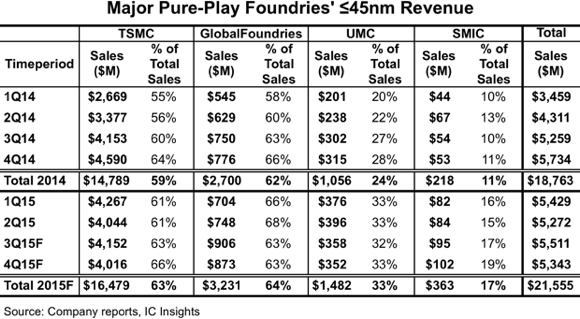 The total pure-play foundry market is forecast to grow 6.1% to $44.9 billion in 2015. The entire increase in pure-play foundry sales is forecast to be due to sales of devices built using leading edge (<40nm) feature sizes. 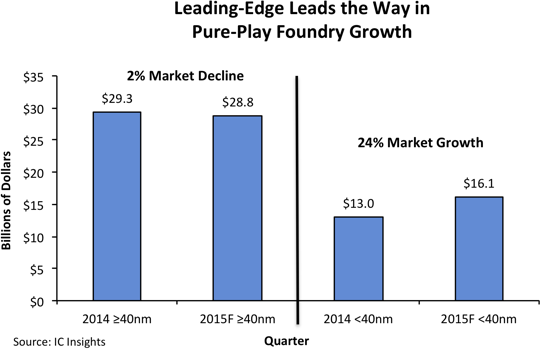 The <40nm pure-play foundry market is expected to increase 24% to $16.1 billion in 2015 compared to $13.0 billion in 2014 (Figure 1). In contrast, pure-play foundry sales of ≥40nm devices are forecast to decline 2% to $28.8 billion, based on findings presented in IC Insights’ September Update to the 2015 McClean Report. As shown, the portion of ≤45nm sales at GlobalFoundries is expected to decrease five percentage points from 2Q15 to 3Q15. This drop is due to the inclusion of IBM’s chip sales, much of which is large feature size RF devices, in GlobalFoundries’ sales figures beginning in 3Q15 (the acquisition was finalized in July of this year). One-third of UMC’s total sales are forecast to come from ≤45nm technology in 2015 and SMIC is expected to sell only $363 million worth of ≤45nm ICs in 2015, or only 2% of the level of TSMC’s ≤45nm sales forecast for this year.